Take almost all of the work out of pool care. Most people with automatic pool cleaners only vacuum twice a year: opening and closing. 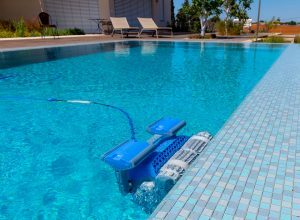 Plus, automatic pool cleaners vastly improve circulation; keeping water cleaner, clearer, warmer, and safer. Pressure side: Best at leaves, bugs, and larger items. Does not require a strong filter, does not clog the filter. Works on water pressure returning to the pool. Suction side: Best at dust, pollen, and silt. Requires a decent filter, and will slow down as it clogs the filter. It is just like your normal vacuuming. Works on water being sucked into the skimmer. Usually requires the water temperature to be at least 70oF in order for the hoses to be flexible enough to run properly. Robot: Excellent at everything. Completely independent of the filter; works on low voltage electricity via a transformer from 110V (included). Generally, one motor moves the unit, while a separate motor pumps through an extremely fine filter. Easiest to set-up and operate. Ask to see our Exclusive Lifetime Labor Warranty. Click here to see our current program.